When it comes to money, you want to keep it safe. You may invest but safety comes fi rst. You want to minimise risks to your wealth at every stage. There are times when you tend to give more importance to safety than wealth creation. The fear of losing your hard-earned money makes you do that. This Independence Day, get to know these fears and get rid of them. Opportunity does not knock twice. And, even if it does, your ignorance can let it go. This can happen even in the case of investments. You fear making the most of investment opportunities because of lack of fi nancial knowledge. You may have the money to invest, but limited knowledge stops you from making the move. Get freedom: Increase your fi nancial knowledge by reading fi nancial newspapers. You can also browse through the knowledge centres of reliable fi nancial websites. You may not know everything about investment. But, you can certainly approach others for guidance. But, you do not know who these others can be, or rather, how these others will be. It is human tendency to not trust easily. This trust becomes a bigger issue when your hard-earned money is involved. You, thus, do not pay heed to people’s investment advices. Get freedom: Instead of approaching friends or relatives, approach professional fi nancial advisors after doing a careful examination of their track records. Different people have different fi nancial Goals. Goals differ but the fear of not meeting them is more or less the same for everyone. You have a set of Goals to achieve. And, you want to achieve them within a specifi ed timeframe. The mere thought of deviating from this plan is scary. The uncertainties associated with investments, thus, stop you from investing. Get freedom: Defi ne your Goals clearly. Do a careful analysis of all the investment options available to you. Weigh the risks and returns of each of them. Next, choose the investment that will give the expected returns with minimum risks. While making your way to an independent life through investments, you ought to be mindful of certain things. Even a small investment mistake can cost you lakhs. For example, if you do not review your investments regularly, you may end up holding a loss-making investment. Apparently, losing money is worse than failing. And, this is another major reason why people don’t invest. Get freedom: Never stop saving, diversify your investments, and have an Emergency Fund. These ensure that you have a fall-back option even if you make mistakes. One of the biggest myths of investing is that it’s a rich man’s game. Some even think that the popular investments are only for those who possess a lot of money. With limited money, they believe, they can only opt for traditional investments that may not generate attractive returns. And, this why they prefer not investing. Get freedom: Look for popular options with low minimum investment amount. Mutual Funds, for example, allow you to invest with even `500. 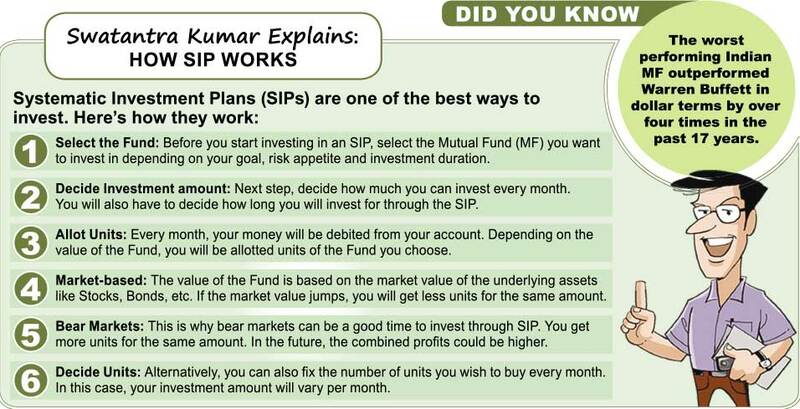 This is possible through Systematic Investment Plans (SIPs).